Identifying catalytic opportunities for economic development and future investment. The West Side Strategic Revitalization and Airport TIF Implementation Plan is a strategy that will provide both a comprehensive vision for revitalization of the West Side of Indianapolis as well as provide a strategic investment framework for the Airport Economic Development Area Tax Increment Financing District (Airport TIF). MKSK engaged the public in three topic-specific workshops, and included neighborhood, business, and airport stakeholders in the process through a series of stakeholder committee meetings, individual and group stakeholder meetings, and focus Group meetings. 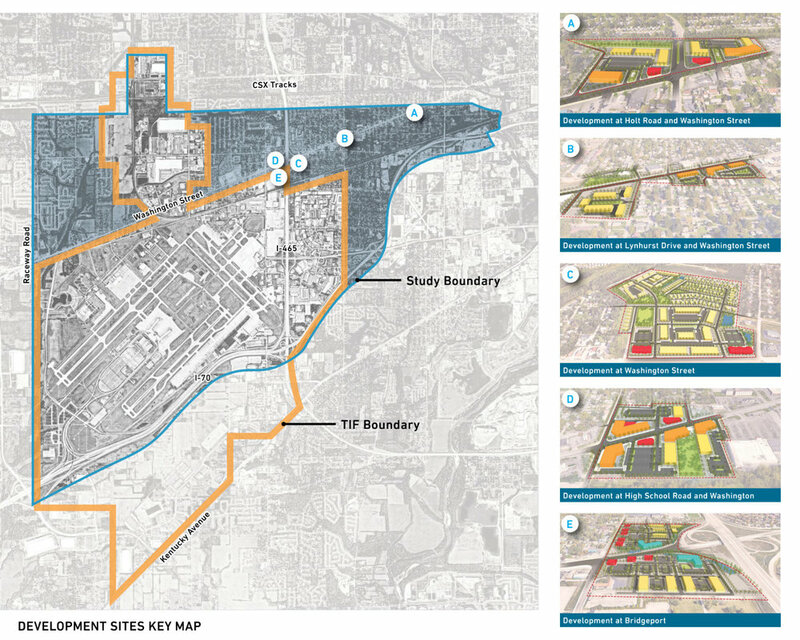 The plan includes recommendations for locations for renewed neighborhood and commercial centers; identifies redevelopment strategies near Blue Line Bus Rapid Transit stops on the Washington Site; and identifies overall form and character of new development, open space improvements, and streetscape and connectivity improvements such as sidewalks, trails, bike lanes, and the Indianapolis Airport.